The pinto abalone has an oval shell with 4–6 holes and can grow up to 6 inches long. The outside coloring can be red, pink, tan, or mottled. The inside of the shell is mother of pearl. The muscle is cream colored in the center, mottled orange on the sides, and darker orange at the foot. There are tentacles around the foot and a fold that may be speckled or solid brown or black. The abalone’s head has two large tentacles, eye stocks, and a rasping mouth. It is thought that pinto abalones are capable of reproducing once they reach a length of 2–2 ½ inches. A mature female’s reproductive organ is an orange color while the male’s is brown or black. Pinto abalones form aggregations to spawn. Males and females simultaneously release gametes into the water column. After fertilization, the planktonic stage lasts 12–13 days. There is expected to be some small degree of larval exchange. Larvae settle in areas with coralline algae. After settling, it takes the pinto abalone 6-8 years to reach maturity. Pinto abalone feed primarily on marine algae. It can consume small forms of algae up to forms as large as bull kelp. The pinto abalone has a unique response mechanism when pursued by sea stars. The abalone will raise its shell and twist its body. This sweeps the shell from side to side, and the abalone moves quickly away. The pinto abalone is mobile but rarely moves far during its adult life. The pinto abalone inhabits fairly shallow areas of the coastal waters of southeast Alaska. It is known to occur from the Dixon Entrance north to Icy Straights, but fishermen have reported it west from Cape Spencer to Yakutat. Outside of Alaska, the pinto abalone is found along the Pacific coast as far south as Point Conception, California. This species of abalone requires exposure to ocean currents. They are frequently found in kelp beds and on rocky bottoms. Most occupy the sea floor from low-low tide to minus 30-40 feet. 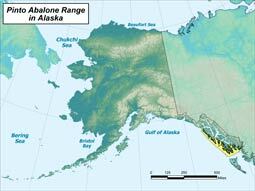 The abundance of pinto abalone in Alaska declined sharply from 1982 to 1995. 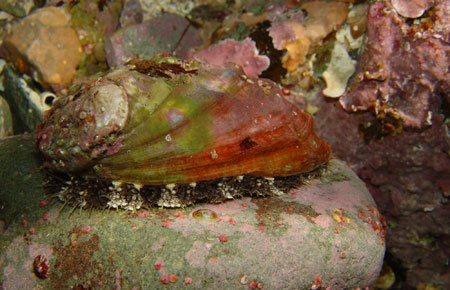 Pinto abalone are continuing to disappear in large areas of its range due to predation by sea otters. Pinto abalone is especially vulnerable to overharvest due to several characteristics. It has a patchy distribution, short larval period, and slow growth. It also has low recruitment that comes in irregular waves. Adults aggregate during spawning. All of these characteristics make the species prone to localized depletion when harvest is concentrated in a given area. Abalones are a favored prey species for sea otters. As otters continue to recover and expand their range they can be expected to decimate all abalone populations in their range. Though no documented cases of abalone disease have occurred in Alaska, disease has impacted pinto abalone and other abalone species in southern areas of their range. In California, other abalone species have suffered Withering Syndrome. In aquaculture studies in British Columbia, their juveniles were killed by the parasite Labryinthuloides haliotidis. There is the potential for this parasite to spread northward or for diseases to be exchanged between abalone species.